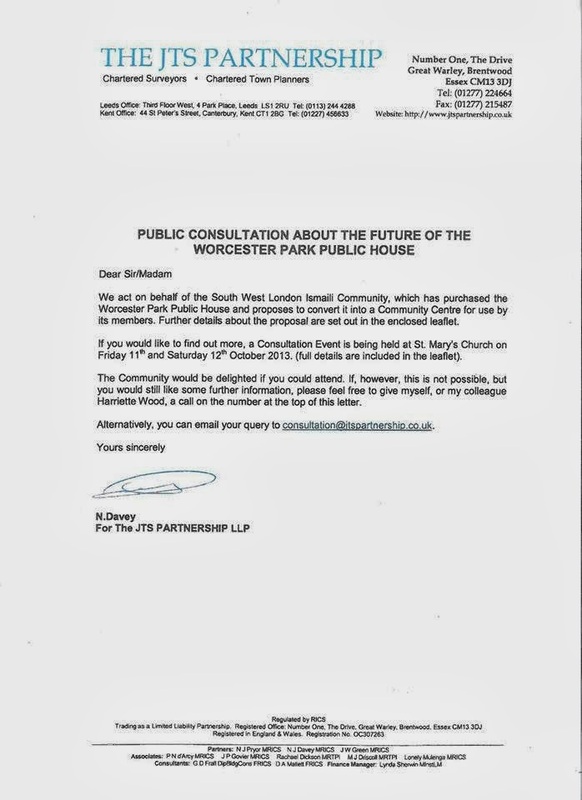 Many residents in the vicinity on the old Worcester Park Tavern have this morning received a letter inviting them to a public consultation about proposals to convert the Tavern to a Community Centre for the South West London Ismaili Community. Ismailism is a branch of Shia Islam led by His Highness Prince Karim Aga Khan IV. 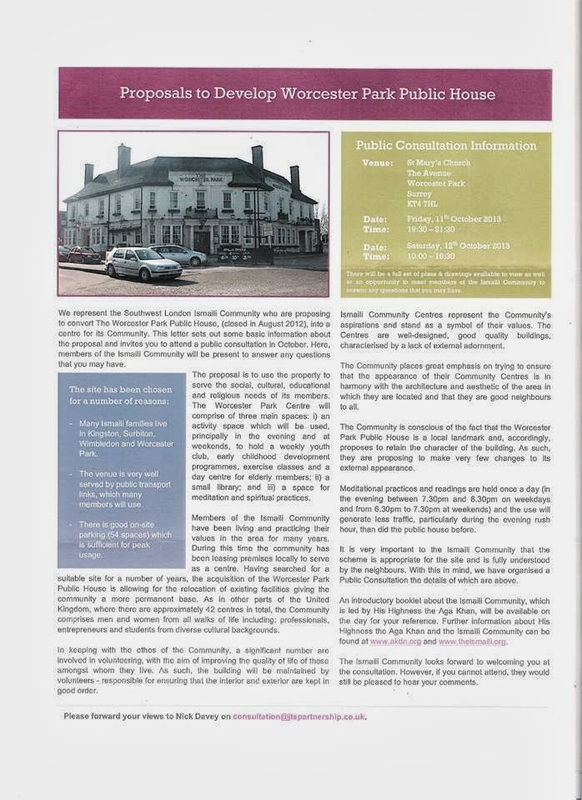 This is a completely different branch of Islam to the group which wanted to convert the old Bank Chambers in Green Lane to a Mosque. They were representing the 'Ahle Sunnat Wal Jama'at' branch. 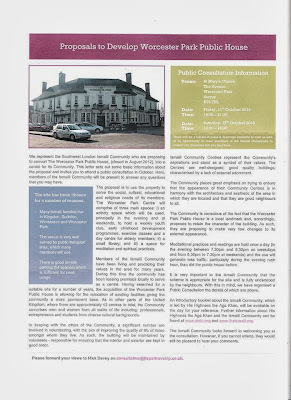 Readers will remember that the Tavern was bought by Shahrastani Development Limited, run by Shiraz Bhogani and Nameem Bhogani, last year from the Spirit Pub Company. At the time Shiraz Bhogani, said they were ‘land banking’ and were looking at all the options and so couldn’t say for definite what it would be but added, “But we do specialise in hotels”. A little internet research suggested that they did indeed have a history of Hotel development and had several hotel based concerns including Sojourn Hotels. The land is now owned by the Southwest London Ismaili Community. Whether or not Shahrastani Development sold it to them or actually bought it on their behalf, I don't yet know. The current proposal for the centre does not include a Mosque and is looking to retain the character of the building, making very few changes to its external appearance. They are looking to hold meditational practices and readings once a day (in the evening between 7.30pm and 8.30pm on weekdays and from 6.30pm to 7.30pm at weekends). They claim this will generate less traffic, particularly during the evening rush hour, than did the public house before. They are looking at 40-50 people attending each day (there is parking for 54 cars) with a maximum of 120 attending for special occasions such as festivals etc. Everyone is invited to the public consultation which will take place at St Mary’s Church in The Avenue, Worcester Park, KT4 7HL on Friday the 11th and Saturday the 12th of October. The Friday session is in the evening from 7:30pm until 9:30pm; Saturday’s is during the day from 10:00am until 4:30pm. I have no doubt many Worcester Parkers will be there.